Ricky Strickland started this July 1991 game strong for high-A Prince William, according to The Washington Post. Strickland hit a one-hopper over the wall for a ground-rule double and he soon came around to score. Strickland's Pilots then went on to a 7-0 win, The Post wrote. Strickland was in his third professional season that year with the Yankees. He went on to play in one more. He made AA, but he didn't make it higher. 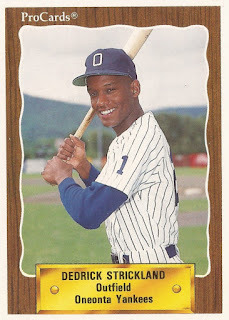 Strickland's career began in 1989, taken by the Yankees in the 34th round of the draft out of Austin Peay University in Tennessee. Strickland played his first season between the rookie Gulf Coast League and short-season Oneonta. Over 22 games on the year, he hit .259. He returned to Oneonta for all of 1990. The outfielder hit .245 and stole 20 bases. He moved up to high-A in 1991. He played the bulk of the year at Prince William and he got some time at Fort Lauderdale. He had two hits in a July game and a triple in an August contest. He hit .207 on the year. Strickland played 1992 back at Prince William. He also got 11 games at AA Albany-Colonie. He had an RBI double in an April game at Albany. Overall, he hit .214. It was his final season as a pro.